Bible Cartoons: Proverbs 14:12 - Path to death, or life! Proverbs 14:12 - Path to death, or life! Click here to see this scene in Bible Cartoons, with notes & purchase options. This is an accompanying article to the Proverbs 14:12 – “Path to death” cartoon illustration, in which I want to look at the meaning of the Proverb more closely. To me, this verse means that people choose a route, or pathway for their own lives, & happily walk down it. I suppose the “path” is a metaphor that represents life’s journey: from birth, through infancy, childhood, adolescence, to maturity, old age & eventually to our physical death. I’m sure we are all aware of the many, many choices that we face, each & every day. In terms of this “path” metaphor, each of the choices we face, at any given moment, can be seen as alternative tracks that lead off in various directions from where we are standing, right now. We sometimes become aware of these choices, when we say we are at a “crossroads” in our lives; we are presented with several different choices & we have to pick one & “walk” down that pathway. The man in my cartoon illustration (see above) has just made one such choice in his life, as we see there is a crossroad behind him, where he had 5 different routes, or pathways, that he could have chosen to walk along (assuming he couldn’t turn around & go back the way he came!) In this case, he has chosen to go straight ahead. But as we can see, he is actually heading for the grave – complete with the RIP (Rest In Peace) gravestone & skeletal, death-figure beckoning him forward. Perhaps the man is only dimly aware of the choices he faces; perhaps he does not know that he is going towards death, rather than life? He has his eye’s closed – in self-assurance that he knows where he is heading, & he is self-confident of his own ability to choice the best course or pathway for his life… but as we can see, he is actually heading right into the grave. It’s a scary thought, when you stop & think to yourself: “where am I heading – towards life or death?” Sooner or later, everybody faces that choice. I think this particular Proverb is saying that there is a pathway that presents itself to our minds, which (on the face of it) seems sensible, helpful, & that appears to lead to our happiness, fulfilment & security. In fact I think there are many, many pathways or routes that look as if they may be helpful to us. But, as we all know, looks can be deceiving! Clearly, we are quite capable of making (poor) choices, which, in fact, do not lead to our own happiness, fulfilment, & life, as we had hoped they would, but instead they lead to our (eventual) eternal death. 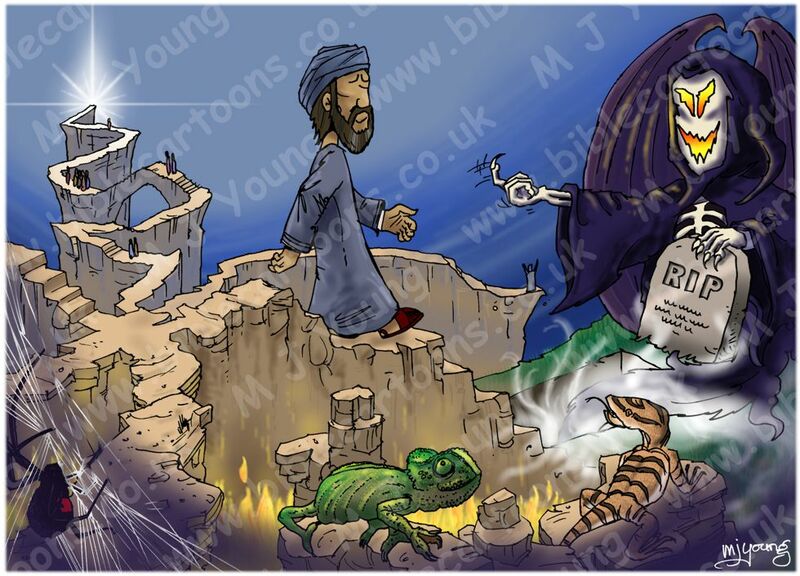 This illustration is intended as a stark warning – BE SURE WHAT PATH YOU ARE ON! It may seem to be good, & you may hope that your choices will lead you to life & eternal life after death, but you need to be certain. The Bible makes it clear, it is not by good works (your deeds & actions) that you gain God’s blessing & eternal life. What could that be talking about? Is there a way (a path) that looks harmless enough, but in fact leads to hell? I believe there are many pathways that lead to hell… which is eternal separation from God in Heaven. I am equally certain that God repeatedly gives us ways & means (other pathways) & reminders & signposts, by which He says “Don’t let yourself be lead astray, to Hell, but rather believe in Me & come to me in Heaven.” The Lord God does not make it hard or arduous for us to become Christians & to gain eternal life. In fact, it is easy to do so. So, what pathways lead to hell? Any choice that we make which is self-centred, selfish, & self-motivated. You only have to watch TV or listen to the radio or read a magazine to see endless people telling you where “true” happiness lies – in the fulfilment of what makes you feel right: what’s good for you. Business today is all about grabbing as much market share as you can. There are hostile take-overs; there are plenty of people willing to stamp all over anyone who gets in their way. And we hold such people up as “heroes”! I think the stark reality is this: if you are out to get what you can grab & hold onto in this world, the you will likely miss out in the next life. Jesus told us to take care of our neighbour, not just ourselves. And above that, he told us to love God the Father first & foremost. If we can’t honestly say that we are Loving God & loving our neighbour then how can we be sure we aren’t on that pathway that leads to hell? This scripture promises that Jesus will prepare a place in Heaven for anyone who calls on his name & becomes a Christian. It also promises that he will come back & take us to be with him… so he even shows us the pathway that we are to follow. When Jesus says, “I am the way and the truth and the life. No-one comes to the Father except through me” he is simply saying that no other way has been made, by which we can obtain eternal life, or life after (physical) death. Repentance is not merely confessing your wrong-doing though. After all, that is simply agreeing with God that you have done something wrong! True repentance is turning away from that wrong-doing; doing a 180 degree about face, & being determined not to engage in that activity (whatever it was) again. Once you have repented & confessed that Jesus is Lord & invited him into your life – that’s it: Your a Christian! And when you become a Christian, you have the assurance, according to what God Himself has told us in his Bible, that you will be saved; that you will inherit eternal life; & that all the resources of God Himself are at your disposal, as an adopted son/daughter of the One true God. How great is that! ?